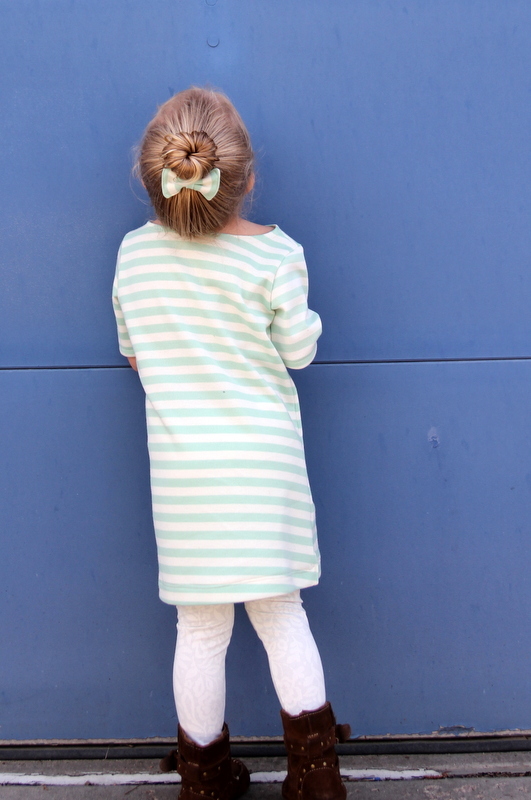 I am (finally) finishing up my back-to-school sewing for Piper Jane (after this top, this dress, and this dress)… and, let me tell you friends, we are going out on a high note. Never mind that it’s almost October, right? 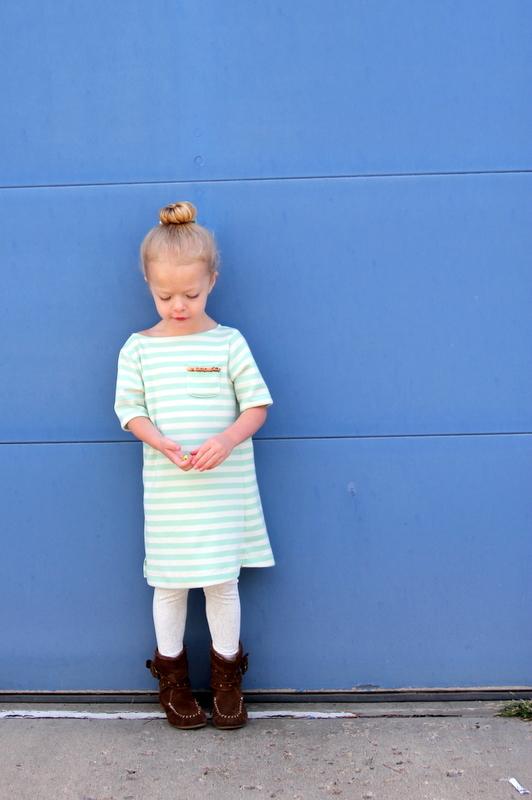 This Back to School Bateaux A-Line Dress, sewn using this pattern by Anneliese of Aesthetic Nest and (most recently) Wee Muses Sewing Patterns is one of my favorite sewing patterns I have ever tried. Seriously. Anneliese’s projects are always gorgeous and flawless- of course her patterns are perfectly executed as well. The finished product is gorgeous in it’s J-Crew-y, classic styling (though, with a less preppy fabric choice, the clean lines would take on all sorts of looks- bright, playful, granny chic)! As per the patterns instructions/measurements, I made Piper Jane a 2T dress with the 3T length. I am pretty much in love with stripes (you should see my closet,) and am especially enamored with this mint-and-cream goodness that I found at Michael Levine in LA. It’s a thick knit, but really soft, almost like sweatshirt material minus the fleece-y lining. I got a ton of it (like, three more yards) and can’t wait to make a whole line up of mint striped projects. 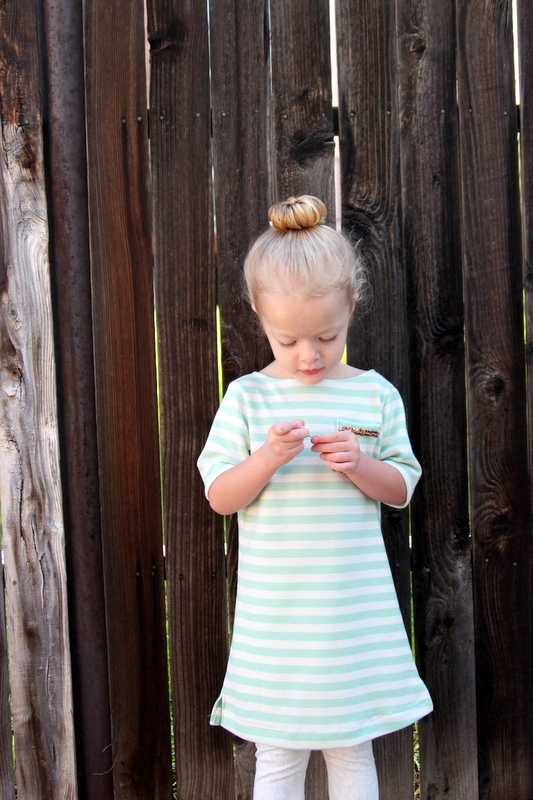 I even made Pi a coordinating mint striped hair bow- the perfect compliment to her little toddler top knot. Plus, I think the row of sequins I added to the pocket for my sparkle-girl took almost as long as the rest of the sewing combined. Minus the sequins, I think this entire dress would probably take and hour and a half to sew. Of course, I already have the next one cut out and sitting on my sewing table; I cannot wait to make more of these little cuties! *Disclaimer- I received a free copy of this pattern as part of the pattern tour. All opinions entirely my own. Adorable! love the detail trim on the pocket. 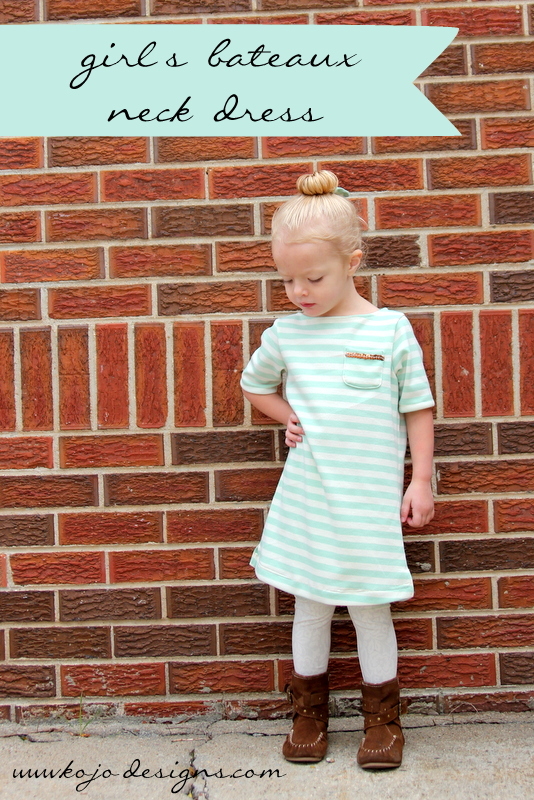 I love this mint and cream striped beauty on your beauty! Thanks so much for sewing on the tour, Kirstin. Your take on this is perfect! My next sewing project will be baby gifts. I love this dress. 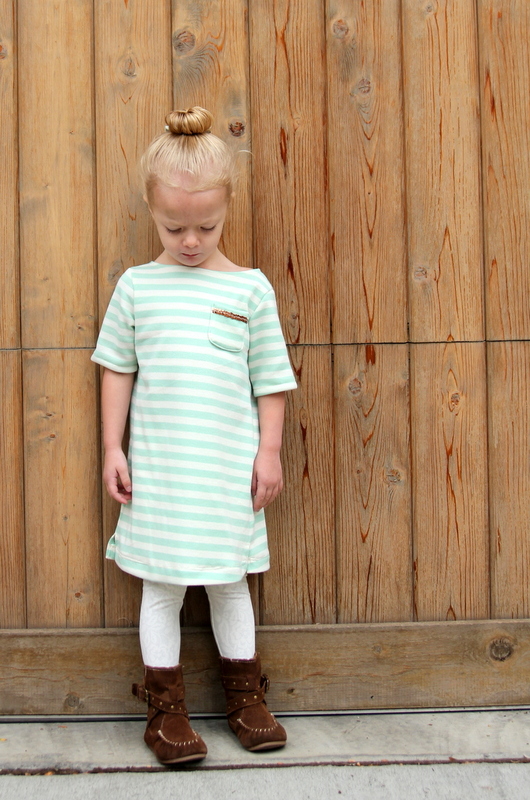 The mint stripe is so cute! I am making a Washi Dress as a birthday present for my sister. But for the next project for my daughter, I want to sew her something in a knit fabric, so this pattern would be perfect! I would love to get this pattern. Got boys over here..and nieces abroad…the versatility of this pattern would give me opportunity to switch styles and colors for sure ! I love your version of this pattern! i’m sewing school clothes for my kindergartener. I just finished a dress and some shoes for my baby girl. I now have a shirt to refashion for me, then 2 more dresses and a skirt for my baby girl. Can you tell I am excited for finally be sewing for a girl after having 3 boys. I’m sewing my daughter some skirts for kindergarten, but I would love to sew the Bateaux Neck for her too!!! I am sewinv a wardrobe for my 5 year old voys beat for his b day. I have really been wanting to try this pattern. Adorable! 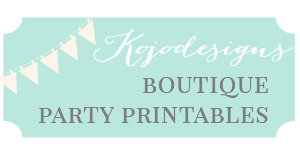 I have a handful of skirts going now, but I would love to add one of these sweet dresses to the mix! 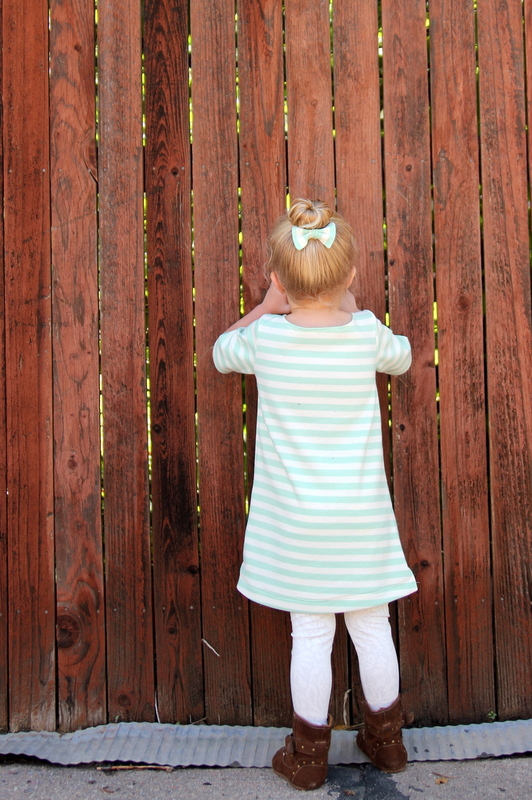 I am working on fall curtain dresses for my girlies. Then comes bedding for my boy. Love the sequins on the pocket. Such a cute dress! I’m working on Halloween costumes and ruffled curtains. My next project are pants for my eldest boy. Such a great shirt/dress pattern! Something simple to get myself back into sewing – infinity scarfs for my daughter and maybe for her friends for her bday. Love the Bateau style dress! I’m currently making winter coats for my two girls. Love this! My poor sewing machine has been sadly neglected, but I have so many projects waiting to be finished: a dress for Miss H, a gift for my niece whose birthday was this past Friday (oops! ), and a cover for the daybed in the playroom. I am still working on back to school sewing also. I have 3 skirts planned to coordinate with some sweaters we bought and are forlornly waiting their turn in the closet. I want to begin doing more personalized clothes for my kids and this pattern seems like a great place for a beginner like me to begin. this is sooo so adorable! I am in love with the fabric! (soo jealous) and I love the sequins. So playful and preppy! I have a paper fan dress waiting for the skirt to be put on. And it needs to be done before Sunday! I’m sewing a little gift for a sewing friend’s daughter! 🙂 LOVE your version of the bateau and would love to win, since I had to say no to the tour! I love the a-line version of this dress! I’m finishing up a quilt & need to get back to sewing my daughter some fall/winter clothes. What a cute dress! I’ve been sewing up some undies for my kiddos. At the moment, I’m sewing a travel changing pad (a pretty prudent pattern) as well as quilting a blanket and planning my own wedding dress! I’m working on a baby blanket for my new baby boy! I am finishing up back-to-school clothes and would LOVE to add this. I have the perfect fabric for it! Just finished a roly poly pinafore, next more leggings and dresses for my little girl! Maxi skirts and tote bags!